What’s Battery-Hogging My Galaxy Note 8.0? | iStoryang HaaayTek! What’s Battery-Hogging My Galaxy Note 8.0? With so many updates automatically downloaded and subsequently installed on my Samsung Galaxy Note 8.0, it’s hard if not impossible for me to pinpoint the culprit on the battery-hogging problem that my tablet has experiencing. 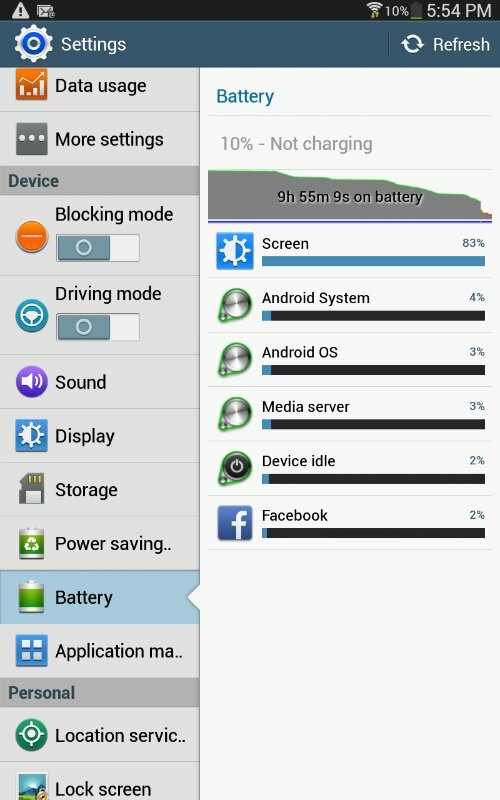 Even at more than 50-percent of battery life, my Note 8.0 displayed these past few months an unusual flickering of the screen indicating a diminishing power supply. In fact, i have to connect the charger when it is below 50% battery life otherwise the tablet either reboots or turned off. As usual, i do some surfing around to look for answers on what’s bugging my tablet these days. Some posts say they experienced the same and suspected the OS updates for causing the trouble. I can remember installing updates of the Android Jelly Bean OS–the latest was the 4.2.2 update. The Note 8.0 is stocked with the Jelly Bean 4.1.0 when shipped from its factory. The 4.1.0 was released on July 9, 2012 and is an incremental update primarily aimed to improve user performance of its interface. On the other hand, the 4.2.0 was released three months later and is said “A new flavor of Jelly Bean”. It improves a lot of the Jelly Bean’s functionality including Daydream screensaver and Photo Sphere panorama shots. The 4.2.2 update supposedly fixes bugs and enhances performances of our Android tablets and phones. But just like some of the online commenters, i am not sure if the update caused the hogging. Just lately, i have noticed that Google Play Services app is kept on crashing. Earlier, i had checked on the battery usage in the Setting and found that the app is eating much power. I wasn’t able to screen grab it but this post has it. So, i tried stopping the Google Play Services and uninstall it in the meantime to troubleshoot my tablet. Screenshot below left shows Google Play Services in the Google Play Store back to its factory state while the screenshot at right shows the battery usage at 51% power left without already the Google Play Services updates. The downside for not updating the Google Play Services includes paralyzing some Google services like Hangouts and Google+ which i don’t care at all. 🙂 (I’m contented with using Facebook and FB Chat). Since then, i can fully use again my Note 8.0 even at less than 10% battery left. 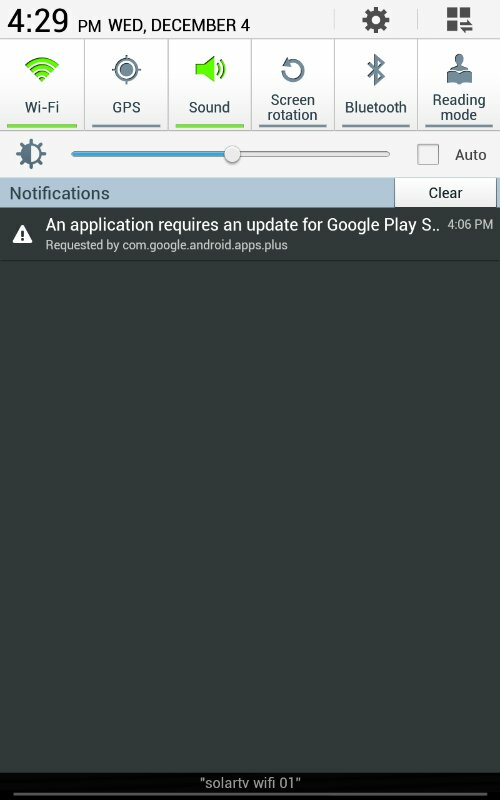 The only thing annoying is Google always ask you to update the Google Play Services to let its other services work. Bleeh! Sorry Google, maybe it’s not only your fault. I still have encountered the flickering of the screen on my tablet even i had already disabled Google Play Services. So, i finally decided to reset to factory setting my unit and see if it got cured. And it’s not only once, i reset it twice back to original state. Finally, it seems the trick works and the unit had not experienced anymore the flickering as of Monday (Jan. 6, 2014) and i almost consumed the battery power before recharging it. Maybe, there’s one app or update that caused the flickering. I’m still observing my Note 8.0 and i’ll update this post as soon as i’ll have another experience. In the meantime, i am saved of bringing the Galaxy Note 8.0 to the Samsung Service Center for repair or diagnosis. The temporary relief i reported in Update 1 is really short. The flickering of the screen and the apparent diminishing battery life had reoccurred. But still i have been persistent that it’s not the battery of my Galaxy Note 8.0 that is defective. Once again, for the nth time, i reset the unit to factory setting hoping i could trace the culprit. For a week now since i reset the unit to factory setting, my Note 8.0 seemed like going back to its original state. I can already consume in full the battery life even until 5% left when the battery-saving feature started to effect. No more flickering of the screen. No more premature draining of battery. This is how my Galaxy Note 8.0 behaves for almost two weeks now since i’d reset it for the nth time to factory setting. But again, i haven’t catch the culprit. What caused the problem months ago? I must confess why i was so hesitant to believe that the battery of my tab is already defective that caused it to flicker the screen and prematurely drained. I actually opened my Galaxy Note 8.0 hoping to see physical defects that could pinpoint or just give me hint that the battery is already defective. I am a trained electronics technician. I know how to diagnose a defective appliance even without using a tool (e.g. multi-tester). In the case of a defective battery, i use my sense of sight and sense of smelling to diagnose it. Usually, a defective battery shows signs of bloating indicating a blown out cell inside it. It usually smell like overly toasted bread because of any burnt parts. The battery of my Note 8.0 doesn’t show any signs of battery defect. So, i decided not to remove it and everything saves me time and money to send my unit to the Samsung Service Center. I got the same problem, i recalibrate my battery a lot, even i change the stock rom and still have the problem. The battery is defective. I just had it replaced and it cost me some penny.